With nearly 6 million points of interest and road coverage for the U.S., Canada, and Puerto Rico, City Navigator North America NT delivers all the data you need to navigate North America. City Navigator brings you the most detailed street maps available so you can navigate with exact, turn-by-turn directions to any address or intersection. You can also route to restaurants, gas stations, hotels, attractions and more. Powered by NAVTEQ, a world leader in premium-quality digital map data. Displays nearly 6 million points of interest — hotels, restaurants, parking, entertainment, fuel, shopping and more. Enhances pronunciation data for compatible Garmin devices that speak street names (example: “Turn right on Main Street.”). 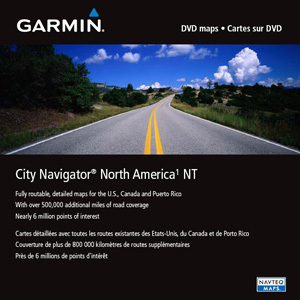 (DVD only) Includes MapSource, computer software that lets you plan trips on your computer and transfer waypoints, routes and tracks between your computer and your Garmin device. Click the map to launch our interactive map viewer*. Pan and zoom to see detailed roads and points of interest included with this purchase. *The map viewer may show a different version than the product you receive. Click the Products tab to see whether this map is compatible with your Garmin device. You cannot use this product to update the maps on your preloaded Garmin device. To order updated map data for your preloaded Garmin device, visit our Update Maps page. Before you can download map detail to a memory card or directly to your compatible Garmin GPS, you must unlock this disk. Simply follow the instructions on the certificate that comes in the packaging to unlock the entire disk. Then, you can download the data to a data card or to your compatible Garmin device. Internet access is required. Includes USB device drivers. 010-00567-00 zumo 550 No Longer Available.